Who doesn't know Rachael Ray and her popular cooking shows? After getting the success and fam, Rachael is here now to show her magic on dog food products too. And the growing popularity of her foods leads us to make a complete Rachael Ray dog food reviews for all our readers. So, what so special about a dog food name under a celebrity chef? Not all celebrity has the gut to jump into a delicate and challenging food chain business. Celebrity chef Rachel always gives us unusual and exciting recipes while cooking on stage inform of lots of audiences. She brings some healthy and tasty treat here for our furry friends too. Some of the recipes direct come into here kitchen recipes. These recipes are mainly based on pet food that she made for her Pitbull, Isaboo. Her first brand Nutrish came into the market a decade ago, in July 2008. It’s the best seller of Rachael Ray dog food brand. Many websites including the official website of the brand provide free Rachael Ray dog food coupons so people could give a try some of these fantastic recipes. The manufacturer of Rachael Ray pet products is Ainsworth Pet Nutrition. The company has been this business around seventy- five years. They started it as a small business for local to regional production. But now it’s a multi-tiered North American organization that makes different types of pet food and snacks for puppies, kitten, cat, and dogs. The original family of Ainsworth Pet Nutrition still involved with the business. They produced a large number of dog food appalling their methods and local ingredients. Those meals were quite popular due to their different test, quality, and nutrition value. Then Rachael Ray came along and the whole story changed day overnight. They started to contribute their workmanship and hard work with Rachael Ray recipes. The great thing about this dog food is beside them giving a nutritious treat is contributing something to other helpless dogs. Rachael Ray run a rescue program named Rachael’s Rescue. They help dog shelters that may be struggling to run or providing nutrition foods. The profit sends to the program of every pound of food you buy from Rachael Ray. So all your money spent on your dog food is also providing another abandoned dog for feeding nutritive meal. Some foods of Rachael Ray Does contain some controversial food element like grain and high amount of animal fat this food brand or any of the recipes under this name has not any recall history recorded yet. If we found anything about Rachael Ray dog food recall in future, we will edit this section. Rachael Ray Dog Food brand has different type protein diet from dry to wet. 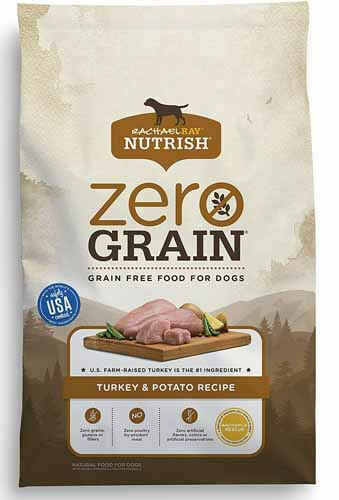 One of its favorite food Rachael Ray Nutrish Zero Grain meal line includes four different foods for dogs. The recipe for this particular product line and the other product of this brand include the AAFCO nutrient profile on its official website and the package of each dog food. Nutrish Zero Grain Beef, Potato, and Bison. Nutrish Zero Grain Chicken and Sweet Potato. Nutrish Zero Grain Turkey and Potato. Nutrish Zero Grain Salmon and Sweet Potato. In here we are going to break down all the ingredients of Nutrish Zero Grain Turkey and Potato to represent components used in Rachael Ray dog food. Protein- Turkey, turkey-meal, chicken-meal, beef-meal. Minerals- Salt, potassium chloride, zinc proteinate, copper proteinate, niacin supplement, calcium pantothenate, biotin, sodium selenite, pyridoxine hydrochloride, folic acid, choline chloride, calcium iodate, iron proteinate, zinc sulfate, l-ascorbyl-2- manganese proteinate, thiamine mononitrate. Also, there are some controversial ingredients used in this food like dried peas and dried plain beet pulp. Dried peas are debated for causing stomachache, liquid stool, etc. problem. But opposed to all that facts, these are an excellent source of carbohydrates and dietary fiber. Turkey: The first item is the primary source of protein. It’s a good source of protein containing more than seventy-three percent of water. But after cooking the water reduced almost one-third and only left is the real meat of the turkey. That’s why this element remains in the smaller portion of the total content of the final meal. Rachael Ray uses really and fresh collected turkey meat for this recipe which not only increases the food value but also adds a food flavor to it. Turkey meal: The turkey meal which is considered a meat concentrate and contains up to 300% more protein compare then turkey meat. This sound may crazy but that true. It added fats as well. Chicken meal: The third ingredient of this dog meal is a chicken meal. This element is a protein-rich meat concentrate which provides amino acid, fat, protein and vitamins. Why Do You Need Rachael Ray Dog Food? The answer to this question can’t give straight; its need explain a bit to why it’s good for your dog. There is six different recipes for dog food offered by Rachael Ray. The form Nutrish Formulas, two forms Zero Grain formula and one is a limited ingredients food. All these recipes are approved from AAFCO and contain food amount of portions, carbs, fat and calories. Let’s see the benefits your dog will get from these meal formulas. The Nutrish foods are premium dog food that enriches with high animal protein. In this formula, they have used chicken, turkey, beef, salmon, etc. animal meat along with some veggies, fruits and some grain like corn, potato or brown rice. The meal provides 335-340 calories per cup. The Nutrish food has one weight control food as well. However, if you want the grain-free formula, then Rachel Ray has that option too. This formula has two recipes the Turkey and Potato and Salmon and Sweet Potato. All these foods are free to form grain and by-products. The first one is enriched with animal protein, carbs and a right amount of fat. Also, it provides vitamin A, B12, C, D, thiamin, biotin and other essential vitamins and minerals. Per cup of Turkey and Potato recipe delivers 313 calories. It’s close to the Nutrish foods. The Salmon and Sweet Potato recipe contain all the essential carbs, fats, and protein along with fatty acids. These are good for their heart, brain development, and immune system especially. Also, it’s good for that dog which already has an issue with overweight problem. 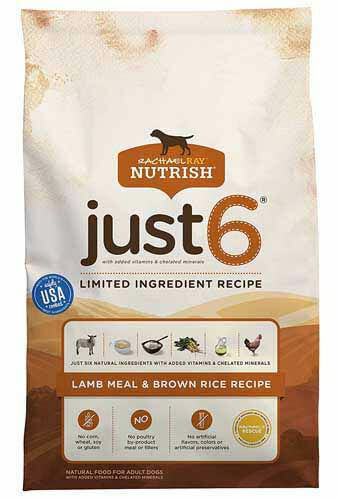 The Just 6 Lamb & Brown Rice recipe is an exceptional option for light protein, fat and high fiber and carbohydrate. It has 22.5 percent of protein, 14.6 percent of fat, 46 percent of carb and 8 percent of fiber. As you can see the carbohydrate level is high than usual including the fiber. This one is food for senior dogs or who have a problem to digest protein often. All these food formulae are light and easy digestive, so any age or breed of dogs can eat kibbles of wet foods. They are free form any artificial color, preservatives or by-products that could harm dog’s health. Overall it’s a high dog diet that you consider to having for your dog. Before buying the dog foods, you must know which one should buy. Here the best Rachael Ray food reviews that I found very promising. Let’s see what they can offer. 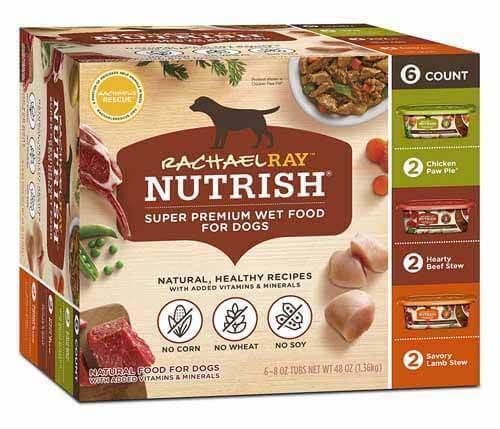 So our first Rachael ray dog food reviews are for Rachael Ray Nutrish Natural Dry Dog Food. It comes in three different verities. Turkey, brown rice & venison. Real beef & brown rice. Currently, they are producing a wide range of dog food products, and the Natural dry food is one of the famous and well-rated dog diets of them. The Nutrish Natural Dry Dog Food is a mix of all the essential food elements that help to keep your canine friend healthy and healthy from inside. Like its name, Rachael Ray offers only naturally raised ingredients in these products. If you see another post of Rachel Ray dog food reviews, then you will know the components of the products are fresh and natural. Like the animal or bird meat used here is 100% farm raised animals and birds. The Turkey that they use for the food comes from Organic US farms, and the real venison is from New Zealand. There is no added artificial color, chemical or flavor for this food. It also doesn’t have any fillers, poultry by-products, wheat, etc. For additional nutrition, the food offers natural probiotics that keep the digestion system of your dog correctly. Besides, the food contains vitamins, minerals, and L-Carnitine. It’s an amino acid that helps in maintaining a healthy weight, healthy muscles, and metabolism. With the meat components, this healthy food offers brown rice, plain beet pulp, cranberries, dehydrate peasem flaxseed, etc. these items are low in fat, easy to digest, and provide a high amount of fiber. The food provides lots of vitamin and minerals along with anti-oxidants which boost his immunity system. This meal is light and easy to digest, so their hunger and motion remain normal and regular. No record of food allergy, so it’s suitable for all kind of sensitive dogs. Not so pricey, compare then another item of Rachael ray pet food this one is really affordable. Some dog owner may not like it for the presence of peas and corn thus it may cause stomachache for few dogs. The Nutrish Natural Dry Dog Food offers all authentic natural ingredients related to animal and plants. It’s good for their muscle to build up, perfect skin, and far increase the immune system. In previous Rachael ray food review we have found a high-quality dog food but with the presence of little grain. That is why here is for you the Rachael Ray Nutrish Zero Grain Natural Dry Dog Food, the most grain and gluten-free option for your dog. This food is also out of artificial color, chemical or flavor to make the product better. Even with zero grain formula, it’s a tasty treat for all age and breed of dogs. Why the grain is unappreciated in dogs food. Many of us now grain is bad for the dog but don’t know why. Actually, the presence of grain makes a diet hard to digest for a dog. How could a dog absorb all the nutrients and energy from a meal if he can’t digest that properly? In that case, the Zero Grain Natural Dry Dog Food is really a light treat for every dog; its kibbles are crunchy but soft and easy to digest. It usually doesn’t stick to its teeth so good for teeth too. Moreover, the ingredients are produced natural sources and collected maintaining a high standard. That’s the reason this best dog dry food is food for their health. They added different ingredients in this food like turkey, turkey meal, white potatoes, tapioca, peas, beet pulp, etc. the turkey and turkey meal is an excellent source of their physical growths and strength. They use organic US farm raised turkeys for this meal. The turkey meal provides vitamin, chondroitin, amino and more. Free from grain (soy, corn) any filler. Provides high animal protein which develops and strengthens their muscle. Provides enough fiber to their meal so it could be a great to combine other dog food if you want. Made of locally raised organic natural ingredients and made with zero-grain formula recipe. Light and natural digestive food suitable for those dogs with a sensitive stomach. High in carbohydrate and protein so some dog may not prefer it that much. The green pea may not suit some dog’s stomach either. 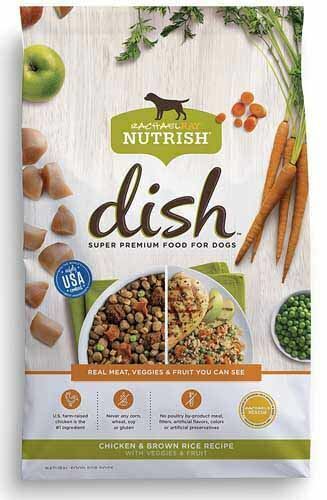 If you go through other rachael rays nutrish dog food reviews or check the price of it; you should know it’s a good and low budget food for daily diets. If your dog is ok with taste and peas (especially if he an ill-weight dog) then admittedly, it’s good food for him. If you read something about Rachael Ray puppy food reviews, you should know they aim of tasty treats that are equally high in food value. 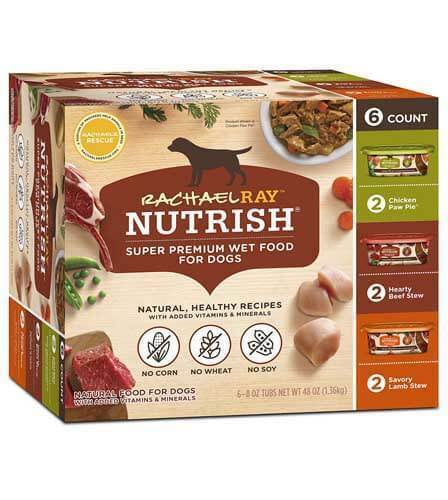 The Rachael Ray Nutrish Just 6 Natural Dry Dog Food is something like that which good for their stamina and maintaining a healthy growth of their body. The Rachael ray grain free dog food is a mixture of six different essential ingredients. I think it’s a balanced source for my huskies. They love its taste, and after having the food, I notice the shiner coat, energy and they put on 2 pounds that month. It’s suitable for any trainee dogs that are active physically in a play or physical activities. The ingredients they use in the food are Lamb meat, chicken fat, brown rice, ground rice, beet pulp. The lamb meat is imported from Australia and New Zealand. It provides a right amount of proteins amino acids and vitamins. Also, it provides Glucosamine and chondroitin. These two things keep the joints of a double strong and healthy. Moreover, they are good for dog’s muscles and organ. The chicken fat is good for maintaining weight and muscle growth. Chicken fat is a good source of omega 3 and 6 fatty acids which keeps the skin and coat healthy and shiny. The brown rice, on the other hand, adds vitamin B, fiber, and energy. From the beet pulp, they will get fiber and probiotics while are good for digestion. This food is free form filler or any kind of preservatives. There is no sign of corn, wheat or soy on this food as well. The food is legit source of protein of your dog. It’s good for provides muscle build up and bon joints. Simple and light food formula provides a good amount of fiber, vitamin and minerals. No added color, grain, preservatives with the food. Good for improving digestion problems and make them active on playing or training. Improve skin texture and makes the coat shiny. Need to use it with other wholesome diet because of its single protein (lamb meat) resource. Kibbles are hard to chew for junior dogs. Overall it’s good for any dogs that need a supplement with their regular food. It’s better to add wet dog for or mix another complete diet with it. The first and only wet dog food of this brand is Rachael Ray Nutrish Natural Wet Dog Food. This delicious treat is inspired by the special recipe of stew from Rachael's kitchen. It’s a simple recipe consisting real meat, whole veggies without any grain. This food is also free form fillers or artificial flavor. The name of the recipes says lots amount them. The first one is made with tender, tasty beef morsels plus wholesome green beans, tomato, and pasta. The brief gravy is really tasty and easy to chew for any dogs. The nest one is chicken meatballs and pasta recipes made with yummy chicken meatball plus soft and crunchy carrots, green spinach and boiled pasta. It comes with little thick chicken broth and low sodium. The others are a hearty beef stew made of warm chunks of beef and peas, carrot, potatoes and made of home-style beef gravy. The rest three are made the almost same manner of broth, veggies and all, but the savory lamb stew and chicken paw pie are little savory in taste. Generally, all this gravy style wet foods are high in protein, carbs, fat, vitamin and minerals. Moreover, they are right to keep your dog hydrate through of the day. Made of natural and ingredients like real meat, veggies and added vitamin and minerals. Six different delicious recipes for your dog to make every meal enjoyable. Helps to maintain their growth and fitness. No presence of wheat, soy, and corn. Affordable price range compared with other wet dog food. Light and easy digestive so suits with all type or breed of dogs. The canned food does not last long once it opened. Not much gravy on the food. Overall a money-saving meal that works well for feeding every day. If your dogs like wet food mostly and you are looking for something adds to the dry food this one is a good option. 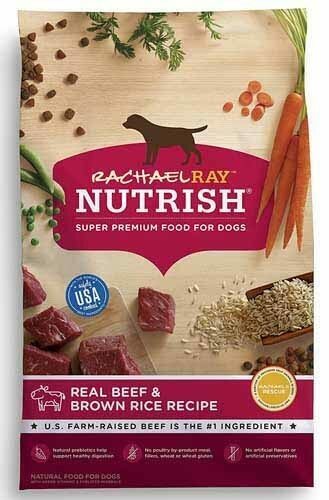 Last but definitely not least my final Rachael Ray dog food review is for Rachael Ray Nutrish Dish Super Premium Dog Food. This food is an ideal option for any dog owner and their beloved furry friends. This one is made of natural and quality ingredients and inspired by Rachael’s kitchen just like the other formula. The food is free from any type of grain, preservative or artificial color. It’s very healthy and most importantly out of any side effects. The main two ingredients of this food are chicken and beef meat which collect from different farms of US. The recipes also consist of potatoes, peas, carrots, dried apples, flaxseed and a lot of items. When you open the bag most of the veggies are visible on the kibbles. Looking those all greeny (peas), orange (carrot) and brow (apple) colors seem beautiful to look at! You can see the cutting veggies and fruits in the food, not the slight presence that often found in other ingredients. This whole colorful and chunky looks is quite helpful for dogs. It’s visually pleasant and appealing and they happy have something like this to eat. This dog diet is beneficiary for their health and growth. It’s delicious and good for dog body and mental development. It’s free from any filler or by-product meal. Furthermore, the animal protein consisting this food helps your dog to build muscle mass and keep them healthy and active. The fruits and vegetable of it provide vitamin A, C, B12, D, probiotics including dietary fibers. New and premium quality dog food for all breed of adult dogs. This food formula comes from organic and natural food ingredients balancing taste and nourishment. Good for their bone, muscle, and teeth. There is no added color, preservative or artificial flavor with this food. Veggie and fruit mix keeps your furry friend active and healthy all day. The food is hard to chew for dogs at the beginning. The cost of the meal is little high. So, if you need a complete wholesome food for your dog, then this might be a considerable one. Due to its high amount of vitamin, carbs, protein, and fiber, it’s appropriate to offers daily nutrition well. Usually, I shop for local feed barn, Petco, PetSmart, etc. and stacked to some favorite brands until I read Rachael Ray puppy food reviews. I was already impressed with kitchenware of this celebrity chef, and now it’s time to see what she is going to offer in this exceptional adventure. While researching on the Internet, I got two Rachael Ray dog food coupons from a pet food site for Ray’s new product line. The first that catch my eye was Nutrish. I ordered it and fed my dogs for 1 and half of months. Here I am going to share, what I got after research, some essential and my experience. Much to the discloser, her first two food ingredients chicken and beef, filler and grain-free kibbles are sounds quite promising. She offers six different treats with different recipes. They are delicious, nutritious and good for the health of your dog. So, not all recipe of Rachael Ray is grain-free. They contain corn meal, animal fat which may be not including them in a premium quality dog meal for large or small breeds. But the grain of fat exists in food in minimal amount. It’s lower than the typical grocery-store food, only fifteen percent. However, the right side of this formula is they are made of fresh ingredients, provides essential vitamins, minerals, and fibers. Rachael Ray follows the proper guideline of AAFCO which brings it another level of quality, that anyone can ask for. This food is available in most people shops to compare then other top brands. It’s still expensive, but I guess it’s an affordable option for most house owner who spends money to buy pricey dog foods. Hope this Rachael Ray dog food review article will help you to choose the best choice for your doggy.